Kalamkari hand-painting on fabric is a technique used to embellish temple cloth and hangings. Painted hangings are used for religious instruction, in temples, and for draping behind the idol in temple cars during processions. The process followed here is even more painstaking than the kalamkari done at Masulipatnam as the entire design is drawn bv hand using a kalam or pen made from wood (tamarind twigs charred to charcoal sticks) and fibre. All the processes are nearly the same as at Masulipatnam except for the absence of blocks. This craft grew mainly around places of pilgrimage and one of the leading centre is Sri Kalahasti in Andhra Pradesh. 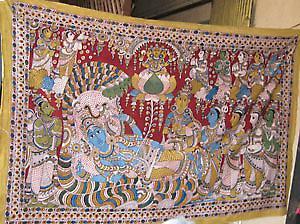 The temple hangings and tapestries from Kalahasti are famous worldwide. Madder and indigo processes are used here and alum is the mordant used to fix the colours. Vegetable dyes in deep rich shades red and blue are used, while green is obtained as a combination of yellow and blue. The washing of the cloth to remove starch and the washing between dyeing and bleaching is done from flowing water in a stream or river. The lines of the design are drawn with a mixture of iron-filings and molasses. The colour schemes used are traditional ones, with women figures in yellow, gods in blue, and demons in red and green. The background colours are usually red with motifs of lotus and other flowers. The aesthetic quality of fine kalamkaris derives from the superb conceptual and technical skill involved in the work. Religious themes dominate, with temples, epics, and mythological figures being depicted frequently. The stories illustrated on these panels are from Puranic legends and from the Ramayana and the Mahabharata. Paintings are usually done in cloth panels which narrate entire stories, with the smaller ones depicting important religious events like Sita's marriage. As all the panels are done by hand, and each one is unique";" no two panels will look the same. A panel may include a story-theme written in verse under it to explain it.